Rackspace offers two types of email services for end-users: hosted email, which you automatically get when you use Rackspace for web hosting, and webmail as standalone email hosting. When you host a site on Rackspace Cloud Sites, webmail is auto-configured to an easy-to-remember web address, like "mail.example.com", where "example" is of course your own domain name! You can also access the universal webmail sign-in page from right here. Once you are logged into Rackspace Mail, the only difference is the white-labeling when you sign in using your domain's custom URL (the version that looks like mail.example.com). Everything else is identical; in fact, you can login to the same email account once from Rackspace's own email login form, and other times from your own domain. 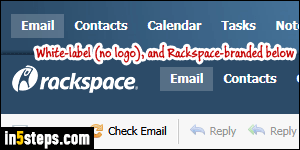 It doesn't make any difference, except for the Rackspace logo which appears in the first case (like on the screenshot). 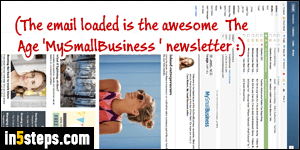 Enter your full email address: with Gmail and AOL Mail, you can get away only entering your username (the part of the email address that comes before the "@" symbol). That's not the case with Rackspace, because your custom URL is just a convenience shortcut: when your credentials are checked, the domain from which you signed-in is ignored. 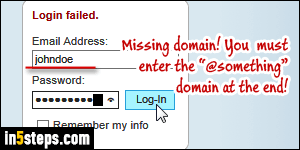 If you enter the correct user name and correct password, but without domain, you'll get the "Login failed" error. Unlike webmail providers like Gmail, Yahoo Mail, or Hotmail / Outlook.com, Rackspace Mail doesn't "remember" you from one session to the other. This means that you'll have to regularly sign back into the service once you've logged out, or if you open webmail in another browser tab. 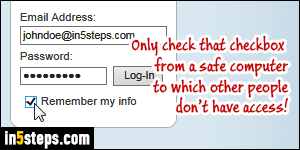 Fortunately, checking the "Remember my info" option stores your username and password (encrypted!) in a cookie, so you don't have to re-type them every time. 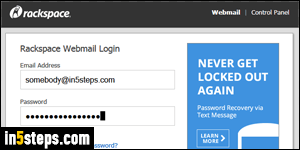 When you hit Enter click on the Log-In button, Rackspace Mail's sign-in form plays nice with your web browser's password manager. This means that, if you chose to make your browser remember your credentials, they'll automatically be filled in even if you didn't check the checkbox, or if the cookie that was created to store your credentials has since been erased. Best of all worlds!